Governments, public schools and universities often lead the way on issues of social and environmental responsibility. From puchases of locally produced and sustainable products and fuel efficient vehicles to a commitment to renewable energy and green building design, public institutions often put their sizable purchasing power to work to create demand for responsible, sustainable, and often cutting edge products and technologies. Now, it looks like Portland metro area public schools could be the next to lend their support to sustainable practices. The Oregonian reports today that 11 Portland-area school districts are planning a new building boom that could result in up to 19 new 'green' school buildings - schools designed to meet national energy efficiency and environmental sustainability standards such as the U.S. Green Building Council's Leadership in Energy and Environmental Design (LEED) standards. If voters support the November bond hopes of 11 Portland-area school systems, it will trigger a construction boom that could dot the landscape with an unprecedented number of shiny new green schools. Metro school districts want to build 19 buildings in coming years. If they get the money, most of the districts are considering erecting buildings that meet national environmental and energy efficiency standards. 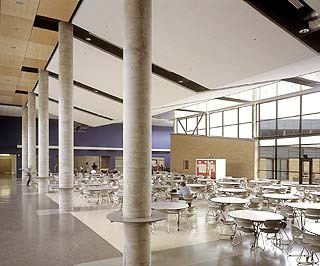 Six Oregon schools -- including North Clackamas High School and the cafeteria at Beaverton High -- currently hold Leadership in Energy and Environmental Design certifications. Portland's new Rosa Parks Elementary School and a school in Canby are awaiting the certification. LEED certification comes from the U.S. Green Building Council, a nonprofit coalition working to promote the construction of buildings that are "environmentally responsible and sustainable." "In the beginning, people were just building schools with four walls to house kids," said Gregory Churchill, an energy analyst with the Oregon Department of Energy. That is changing, he said, and "it is a really good sign for Oregon." Churchill works with districts interested in making their schools more environmentally friendly and efficient. LEED certification requires that projects meet a number of standards, such as avoiding wetlands, building near public transportation, conserving water, reducing energy use, recycling, letting in daylight and providing clean indoor air. Schools can boost their rating status by including options like waterless urinals, solar panels, furniture crafted from renewable wood and systems that capture rainwater to be used for irrigation. Sherwood school officials voted Wednesday to design the new elementary and middle schools the district hopes to build to meet LEED standards. "It is important that the district be a good steward of resources," said Mark Christie, Sherwood's school board chair. "We want to show students good modeling so that they continue to make the good decisions that we made all along." Courtney Wilton, the business manager for the David Douglas School District, said his district will build its newest elementary to LEED standards, pending bond approval. Hillsboro, McMinnville, North Clackamas and others are also considering LEED certification or at least building schools close to those standards. A Forest Grove spokeswoman said her district is not far enough along in the design process yet, but "that is something we'd like to do." While LEED schools can cost a little more upfront, going green can save green over time, said Katrina Shum-Miller, who works for a Portland environmental building consultant company. LEED buildings use less water and energy than traditional ones, with power bills showing savings of as much as 40 percent. And increasingly, green schools are being built for the same cost as traditional schools. When North Clackamas built its new high school to LEED standards, the price tag came in at less than a regular high school. "It makes sense economically in the long run, and I also think it is the right thing to do," David Douglas' Wilton said. "We're living in a world where energy is getting more expensive." The Oregon Department of Energy offers grants and other incentives to help districts recoup additional costs for going green. But cost savings and conversation are not the only benefits. Green schools are simply healthier for students and staff. The low-toxin carpets and paints that are used produce cleaner air to breathe. Studies have shown that daylighting -- using large, well-placed windows to let in natural light -- improves student performance. Districts also use green schools as learning tools for students. Kids at Clackamas High School can go online and monitor temperatures around the building. A similar system is built into Rosa Parks, and students will also be able to study the school's bioswale area, which catches storm water and cleans it before allowing it to seep back into the ground. With just 30 LEED-certified schools nationwide, this year's bonds provide an opportunity for the Portland-metro area to stand out. "This would be a huge increase," Churchill said. "It would be really something, actually." If you are a Portland metro-area voter, I would strongly encourage you to vote for your local school construction bond this November. The bonds are an important and responsible investment in our children, their educatio and health, and the environment that they will inherit. I would ultimately hope that Oregon joins Washington in requiring that all new public buildings - be they schools, fire houses, libraries or city halls - meet LEED silver equivalent standards. Such a policy is part of Governor Kulongoski's Oregon Renewable Energy Action Plan, but has yet to make it into legislation, as far as I know. And I would be remiss if I didn't mention that my alma matter, the University of Oregon recently committed to build all of its new buildings to conform with LEED silver equivalent standards. The UO is currently home to a LEED Silver-rated building, the new Lillis Business Complex and just finished construction on the new Living Learning Center dorm complex which conforms to LEED silver standards (the certification process itself costs quite a bit of time and money, so UO buildings are not required to actually pursue certification with the USGBC).